New York[RR]Vegas–It had all the trappings of a big-ticket prizefight: the glitzy Las Vegas backdrop, the arena-rock production values, the small fleet of celebrities and high rollers at ringside in well-cut suits and couture dresses. But it was an illusion, one that evaporated before the eyes of the countless throngs who believed that the boxing rookie Conor McGregor had any chance in a scheduled 12-round junior middleweight fight against Floyd Mayweather, the undefeated five-division champion and finest boxer of his era. Mayweather needed three rounds to take the two-division UFC champion’s measure before spending the next seven walking him down, picking him apart and closing the show with a 10th-round technical knockout before a crowd of 14,623 at the T-Mobile Arena. Afterward he announced his retirement with a record of 50 wins in 50 professional bouts with 27 by stoppage. Not since a dubious points loss to Bulgaria’s Serafim Todorov at the 1996 Olympics has a Mayweather fight ended without the American’s hand raised. Vegas is a town built on suckers and dreamers and there were no shortage of either in the desert this week for a fight that’s expected to threaten the all-time revenue records set by Mayweather’s megafight with Manny Pacquiao in 2015. Yes, it could have been worse. McGregor acquitted himself nicely, landed a few early punches that raised some eyebrows and precluded the disgrace many pundits expected, but it was still the mismatch augured from day one. McGregor, the 29-year-old southpaw from Dublin, shot from his corner and tried to swarm Mayweather from the opening bell, landing a pair of body shots and a pawing left upstairs. But Mayweather calmly fought off the back foot and assessed the unknown quantity before him, allowing McGregor to throw clumsy, lunging shots that missed wildly. McGregor’s disciplined if raw approach continued into the third as he continued to snap straight right-hand leads while Mayweather tried to set traps. The roughhousing continued as McGregor found the back of Mayweather’s head once more, this time avoiding a warning. Mayweather was struggling to let his hands go, but not for long. Mayweather burst to life in the fourth, stepping into the pocket and landing a right hand and a hook to the body. He continued to close the distance and suddenly it was McGregor in retreat. It took a bit longer than usual, perhaps owing to the 714-day layoff, but Mayweather had zeroed in on his strategy: he would adapt the style of a pressure fighter and fight McGregor inside. Midway through the fifth round McGregor was showing signs of fatigue as Mayweather was speeding up, landing a hard body shot followed by a chopping left hand early in the frame that dazed the Irishman, whose shots no longer had anything behind them. By the sixth McGregor was taking heavy breaths and Mayweather continued to march inside, landing three straight rights that brought the crowd to their feet. Conor McGregor: from plumber to UFC champ and Mayweather challenger – in pictures–The bigger man was getting bullied and not even the chants of “Con-or! Con-or!” that cascaded down from the Irish fans in the upper deck could breathe life into their man. Mayweather was in total control. He continued to press in the seventh with McGregor in survival mode, shredding the Irishman with a three-punch combination punctuated with a right cross. What punches McGregor could manage were devoid of snap. The punishment persisted into the eighth as Mayweather bounced punches one after another off McGregor, snapping his neck back with an uppercut near the end of the frame. 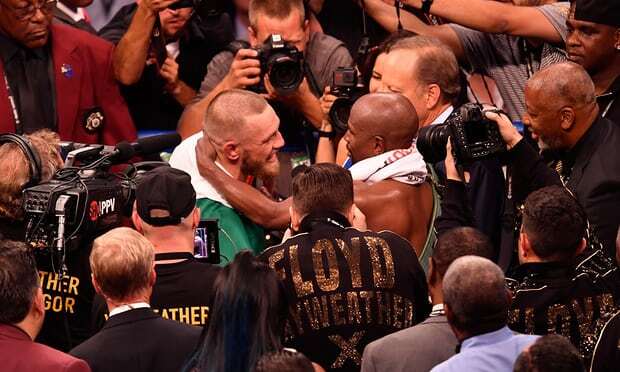 McGregor, in somewhat of a surprise, sprinted from his corner in the ninth and for a third time forced the referee to unwrap him from Mayweather’s back, prompting another stern warning but no deduction. It wouldn’t matter. Mayweather picked right up where he left off in the eighth once proceedings resumed, cracking McGregor with a combination upstairs that left him spun round and handing onto the ropes to stay upright. One, two, three, four right hands connected with McGregor’s head and he looked ready to go, saved by the bell. Relative to expectations, it will leave a better taste in customers’ mouths than the Pacquiao fight, a summit meeting between two all-time greats six years in the making that failed to realize the stratospheric expectations. But Saturday’s scrap lacked the high tension and drama inherent in true championship affairs. McGregor’s devoted believers aside, this more of an event than a fight, less about who would win rather than how it would happen. Fortunately for all, especially the Nevada Athletic Commission who sanctioned it, McGregor gave a better accounting of himself than anyone expected, even as he faded badly down the stretch. Afterward the fighters embraced in the center of the ring surrounded by their handlers, smiles all around. And why not? McGregor had earned a minimum of $30m, a tenfold increase of his previous career-high purse of $3m, a total that could exceed $75m once his share of the pay-per-view receipts, live gate, closed-circuit revenues and foreign sales are tallied. The numbers are even rosier for Mayweather, whose minimum purse of $100m matched the career-high guarantee he made for the Pacquiao fight. That total is expected to swell past $200m once his share of the promotion is accounted for. The enterprise is the pièce de résistance of the genius hatched by Mayweather and scaled to stupefying proportions by enigmatic advisor Al Haymon, the Harvard-educated former concert promoter who seldom appears in public and never speaks to the press. They figured out long ago that more fans would hand over their scratch to watch him lose than to watch him win and they rode the formula to more than $1bn in revenue based on an inconvenient truth: there will always be a market for some in America for the possibility of watching an unapologetic black fighter getting beaten. But for Mayweather, comeuppance never came. And now, surely it seems, never will.